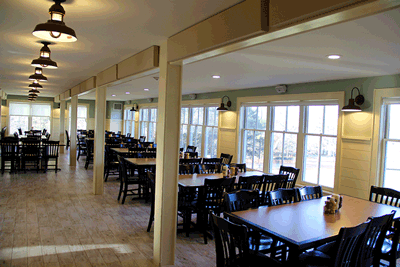 Your group will not forget their meals in our cozy dining room overlooking the lake. Full kitchen service means you will not have to worry about meals for your group. Plan a menu in advance with our chef and leave the rest to us. Meals will be served according to the schedule you select, so you can focus on why you came. Please email Rob Malenich or call at 781.784.8924 ext 101. These menu items are suggestions only. Please contact us if you would like to explore other options. In addition, we have experience accommodating a wide range of special dietary needs, including vegetarian and gluten free. There may be an additional charge for special meals. All Dinner meals served with: Garden Salad | Vegetable | Rolls and butter | condiments | Coffee, Tea, Soda, Juice | Dessert.